Looks who’s back! 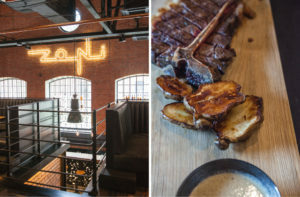 Regarded as Poland’s most maverick chef, Aleksander Baron returns to the trenches having traded in the hipster era confines of Solec 44 for Zoni, the banner restaurant of the Koneser complex. Famed for his devotion to local ingredients and little-known techniques, few push boundaries with quite the same zeal as this rebel chef (his checkered past involves, among other misadventures, being booted out of art school!). His enthusiasm for nose-to-tail cooking, old baroque recipes and forgotten fermentation processes say much for his manic dedication to his natural calling. A complete escape from the grungy commie bunker in which Baron earned his name, the first thought that comes to mind is something along the lines of: OMFG. Housed in a former vodka distillery, everything about Zoni screams of style. Worth exploring, a prowl of the immense interior reveals cast iron kilns, flooring made from recovered vodka barrels and numerous post-industrial pieces that have been lovingly restored. That the interior is so striking is good news indeed: with building work still clanging around the wider area, al fresco dining is only recommended outside of normal hours of construction. With knives and forks located (they’re in a slidey drawer underneath the table), we smash head on into starters. Of these, there’s a carefully assembled scattering of fermented vegetables, with the presence of a two-year-old honey fermented cabbage stump taken as an early sign of the kitchen’s intent. Even more triumphant, a tomato assiette with a smoked tomato at its center and exciting diversions such as a granita with lovage. In seconds, it’s all transformed into a pinkish pond of mushy tomatoey tastes: complex in both texture and temperature, it’s a poster child for gooey loveliness. Mains are a reminder that The Baron loves meat – every single bit. For me there’s wild boar, it’s tongue and cheeks as soft and tender as an angel’s bottom. But the show stealer, that’s a T-bone that lands on the table with much the same thud as a stray artillery round: the world shakes and children cower. As the dust settles, the photographer tears into it like a half-starved beast that’s been given one minute to eat. Trying some myself, I see why. Aged in such a way as to allow aspergillus mushrooms to grow into the meat, it’s a glorious piece of cooking that makes the heart roar. Looking mean and gnarly, just as they should, everything about the side of roasted Jerusalem artichokes speaks of the earthy goodness of Mother Nature. But we haven’t finished. In the name of research, dessert must be had. When it comes to this, my requirements of a pudding are infantile at best: I don’t do grown-up desserts, instead I favor things that are cold and sticky and extra sweet. So yeah, the dessert list isn’t really something that’d usually appeal. But come on, inquisitiveness gets the better of me, so for this reason I plump for a calf brain mousse the incorporates vanilla, brown butter and caramel. Served as a chilled sphere, it’s as curious and intriguing as it is delicate and light – over careful, considered bites I find myself approving. Though Baron’s outlook remains much the same, it’s without doubt a new league he’s entered: the big time. And guess what, he’s aced it. Though still early days in the grand scheme of things, it’s going to take an extraordinary turn of events to see Zoni outgunned as the year’s best launch. Yes, take that as a recommendation.